Ruben Burks is Secretary-Treasurer of the Alliance for Retired Americans. Burks served three terms as UAW regional director, covering 11 counties in south-central Michigan. 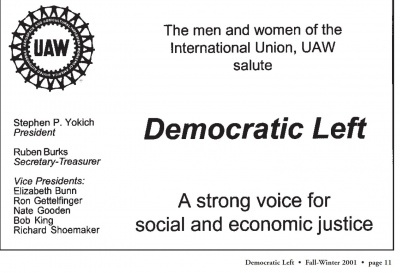 He restructured the Community Action Program to emphasize issue education and recruiting and training UAW members to work as volunteers in campaigns in the region. These activists played a key role in electing pro-working family congressional, state and local legislators. As a member of UAW Local 598 since 1955, Burks began his work life as an assembler at the former Fisher Body Plant of General Motors Corporation in Flint, Michigan. In 1970, UAW President Walter Reuther appointed him to the UAW staff where he served UAW members in General Motors and independent parts and suppliers plants. Burks chaired the United Way of Genesee and Lapeer Counties board of trustees, served as director of the Boy Scouts of America Tall Pine Council No. 264 and the Sam Duncan Memorial Scholarship Fund and as University of Michigan at Flint advisory board member. This page was last modified on 5 November 2015, at 04:42.